Cu tolerance and accumulation have been studied in Haumaniastrum katangense, a cuprophyte from Katanga (DR Congo), previously described as a copper hyperaccumulator. Nicotiana plumbaginifolia, a well-known non-tolerant and non-accumulator species, was used as a control. The germination rate of H. katangense was enhanced by copper and fungicide addition, suggesting that fungal pathogens, which restrain germination in normal conditions, are limiting. In hydroponic culture in the Hoagland medium, H. katangense did not grow well, in contrast to N. plumbaginifolia. Better growth was achieved by adding fungicide or higher copper concentrations. The maximal non-effective concentration (NEC) was 12 µM CuSO4 for H. katangense grown in hydroponics, i.e. 24 times greater than Cu concentration in the Hoagland medium. By comparison, copper concentrations greater than 0.5 µM had a negative effect on the growth of N. plumbaginifolia. EC50 (50% effective concentration) in hydroponics was 40 µM CuSO4 for H. katangense and 6 µM CuSO4 for N. plumbaginifolia. EC100 (100% effective concentration) was 100 µM CuSO4 for H. katangense and 15 µM CuSO4 for N. plumbaginifolia. In soil, growth was also stimulated by Cu addition up to 300 mg kg-1 CuSO4. 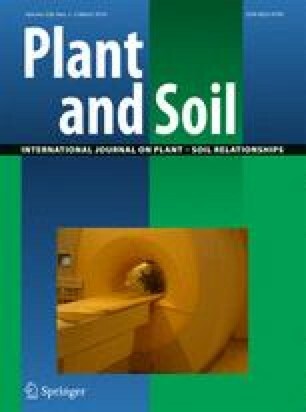 Surplus copper was also required for cultivating H. katangense in sterile conditions, suggesting that Cu excess may be necessary for needs other than pathogen defence. Cu accumulation in the shoot has been measured for N. plumbaginifolia and H. katangense at their respective NEC. Cu allocation in the two species showed a similar response to increasing Cu concentrations, i.e. root/shoot concentration ratio well above 1. In conclusion, H. katangense is highly tolerant to copper and has elevated copper requirement even in the absence of biotic interactions. Its accumulation pattern is typical of an excluder species. This work is part of a “Projet interuniversitaire ciblé” (Project REMEDLU) funded by the Coopération Universitaire au Développement (Belgium). The authors wish to thank the Fonds National de la Recherche Scientifique for financial support (FNRS, FRFC 2.4558.08). C.H. and M.P.F. are respectively postdoctoral and PhD fellows of the FNRS. The authors wish to thank Dr Karin Kohl (MPI, Golm) for interesting discussion on cuprophytes.